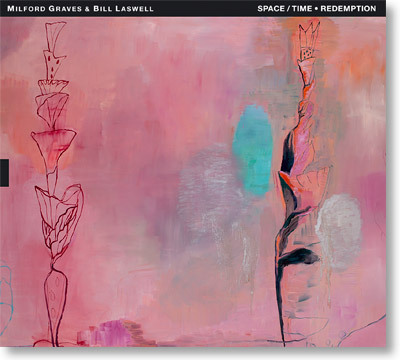 All compositions by Milford Graves and Bill Laswell. Space / Time・Redemption (TUM CD 040) is the first duo recording by the legendary drummer and percussionist Milford Graves, who first rose to the forefront of improvised music in the mid-1960s as a member of the New York Art Quartet, through his solo and duo percussion performances and in groups led by Albert Ayler, Giuseppi Logan, Don Pullen and Sonny Sharrock, among many others, and the equally incomparable bassist Bill Laswell, who is known for his unique electric bass artistry in groups like Material, Massacre, Last Exit and Arcana, for performing and recording with the likes of Ginger Baker, Herbie Hancock, James "Blood" Ulmer and John Zorn and for working as a producer on countless sessions ranging from new age or rock influences to world music and free improvisation. On the five extended improvisations that comprise Space / Time ・ Redemption, Graves and Laswell, who have in recent years occasionally performed live as a duo at The Stone and other New York venues, jointly create a sound world all of their own. The album was produced by Bill Laswell and the recording took place at his studios in West Orange, New Jersey.